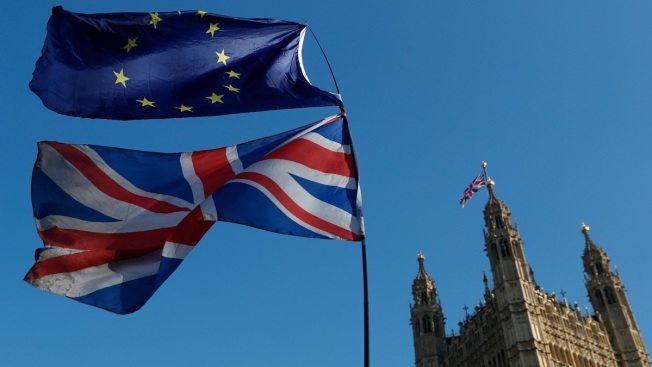 The flag of the European Union and the British national flags are flown on poles during a demonstration by remain in the EU outside supporters at the Palace of Westminster in London, Wednesday, Feb. 27, 2019. 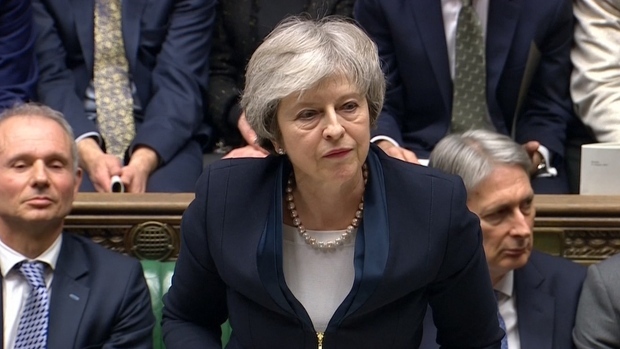 British Prime Minister Theresa May says she will give British lawmakers a choice of approving her divorce agreement, leaving the EU March 29 without a deal or asking to delay Brexit by up to three months. Net migration into Britain from the other 27 European Union countries has fallen to near-decade lows, suggesting Brexit uncertainty has made the country a less attractive destination for the bloc's workers. However, net migration from non-EU countries has risen to its highest level since 2004. Figures released Thursday by the Office for National Statistics show that the difference between those entering the country from the EU and those heading back fell in the year to September to 57,000, its lowest since 2009. Net migration from the EU has fallen from a peak of 189,000 in the year to June 2016, when Britain voted to leave the EU. Immigration and its impact on wages and communities was one of the big issues behind the Brexit vote. "The overall story the data tell on EU migration is clear: Britain is not as attractive to EU migrants as it was a couple of years ago," said Madeleine Sumption, Director of the Migration Observatory at the University of Oxford. One of the perks of being a member of the EU is that people can live and work anywhere in the bloc. That right was taken up enthusiastically in many of the former Soviet bloc countries after they joined the EU at different times since 2004. After Brexit, or at least after any transition after the scheduled Brexit day on March 29, that freedom will ostensibly end. However, as with so many other Brexit-related issues, it's still unclear what a future immigration system in Britain will look like. 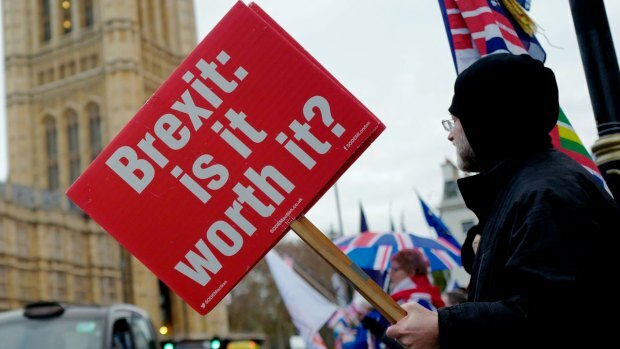 There's now speculation that Brexit will be delayed or even that a second referendum could be held on whether to leave the EU. If and when Brexit does happen, uncertainty will be acute for companies that have in recent years relied on workers from the EU, while Britain works on new immigration rules. "Many areas of the labor market, particularly sectors like hospitality, who are reliant on the free movement of EU workers, are going to have to adjust to lower migration well before the new system is in place," said Stephen Clark, senior economic analyst at the Resolution Foundation. The decline in net migration is not just about Brexit. The fact that many EU economies, particularly those in the 19-country eurozone, have recovered economically has lessened the need for many to search for opportunities abroad. The relative attraction of Britain financially has also diminished. After the Brexit vote, the pound's value sank, lowering the value of any remittances. Sumption noted that EU net migration happened to be unusually high in the run-up to the referendum, "so at least some of this decline would probably have happened anyway even without Brexit." At the same time, net migration to Britain from non-EU countries rose in the year to September to its highest level since 2004, due in part to an influx of students. Overall, net migration into the country stood at 283,000 in the year to September.